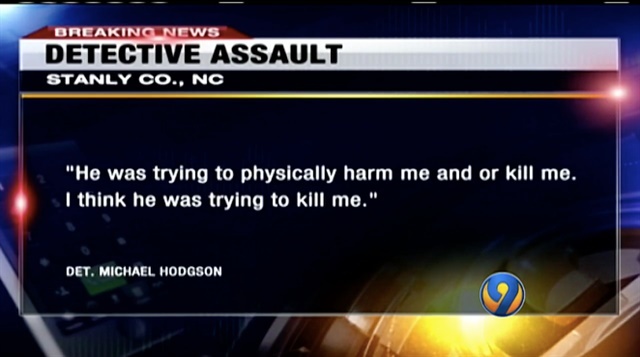 A Norwood, NC, police officer fought for his life during an assault following a traffic stop Friday night. Norwood officials told WSOC that Detective Michael Hodgson stopped a motorist, later identified as Timothy Robinson, for having a defective headlight, and was then pulled into the car by Robinson, who sped away with the door still open, officials said. Hodgson held on with his legs dangling outside of the moving vehicle at speeds estimated above 80 mph, while Robinson continued to kick, punch and fight him, officials said. Hodgson said Robinson told him he was going to kill him and then kill himself. The detective managed to stun the man with a TASER, causing him to lose control of the vehicle and crash. Robinson attempted to run away from the scene but the detective tackled him and took him into custody, officials say. Robinson faces charges of assault to a law enforcement officer with a firearm, attempted first-degree murder, injury to personal property, resisting a public officer, kidnapping, and trafficking in cocaine, among others. He was in jail for less than 12 hours. He paid more than $112,000 to bail out, which is 15 percent of his $750,000 bond.